Eventhough the HomeVision Controller can detect and respond to almost any infrared signal currently being generated by infrared remote controls, it works best with its native infrared format (also known as the NEC format). So, to get the best results when controlling the HomeVision using a Pronto remote control, the Pronto should send those HomeVision native infrared codes. On request from Stephen Bond of Simplified Technologies I created a tool that generates the appropriate Pronto hex representation for the signals, given the HomeVision Device code and one or more Key codes. The tool is a self-contained executable, no installation is needed. Just download version 1.4 of the program (1293453 bytes) and run it. Converting a single Device Code and Key Code combination to Pronto Hex format. Converting multiple Key Codes within a Device Code to Pronto CSF file format. These modes of operation are described in more detail below. After selecting the option Pronto Hex String from the Mode menu, the tool is ready to convert a single Device Code and Key Code to a Pronto Hex representation. 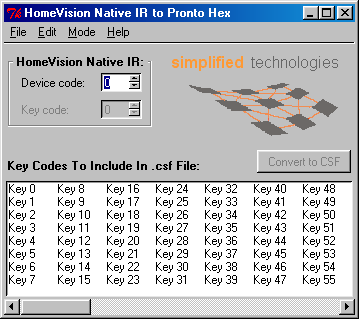 The Device Code and Key Code can be entered in the area labeled HomeVision Native IR. Pressing the Enter key or clicking the Convert to HEX button causes the tool to create the Pronto Hex code. The Pronto Hex code will be presented in the area labeled ProntoEdit Hex Code. The Pronto Hex code is automatically selected so it can easily be copied to the clipboard by pressing Ctrl+C or selecting Copy from the Edit menu. From there in can be pasted as raw code for a button in the Pronto editor. After startup, the tool defaults to this mode. By selecting the option Pronto .csf File from the Mode menu, the tool is configured to create Pronto Source Files. In this mode the HomeVision Native IR Device code should be entered in the HomeVision Native IR entry area. The Key Codes can be selected from the list displayed in the Key Codes To Include In .csf File. Any combination of Key Codes can be selected by dragging the mouse, clicking it by itself, or clicking it in combination with the Control or Shift key. The Select all entry in the Edit menu can be used to quickly select all 256 Key Codes. After the desired set of Key Codes has been selected, clicking the Convert to CSF button or selecting Save as csf... from the File menu pops up a file selection dialogue. This dialogue allows the location and name of the output file to be selected. When the Save button is pressed the specified Pronto Source File is created. A bitmap file named button.bmp is placed in the same directory if a file by that name does not yet exist in that location. This bitmap file defines the image for the buttons on the Pronto screen and is needed to compile the csf file into a ccf file. A tool is available at RemoteCentral to compile the csf file into a ccf file that can be used by ProntoEdit. The tool creates a panel for each group of 25 selected Key Codes. With ProtoEdit you can construct your own layout for a panel and then use the alias function to point to one (or more) of the generated buttons.